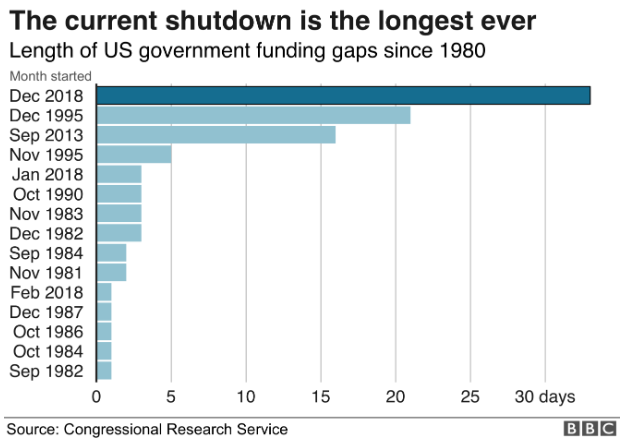 The U.S. Senate has blocked legislation that incorporates President Trump’s proposal to fully open the government and includes his demand for $5.7 billion to help build a border wall, as the partial government shutdown approaches its 35th day - the longest in US history. The Republican-backed bill failed by a margin of 50-47, far short of the 60 votes needed to defeat a filibuster. GOP Senators Mike Lee (Utah) and Tom Cotton (Arkansas) surprisingly voted against Trump's plan. Lee is considered a fiscal hawk, while Cotton is considered one of the Senate's most conservative members when it comes to immigraiton. Democrat Joe Manchin (D-W.VA) supported the GOP-backed measure. Senate Republicans also blocked the Democrats' stopgap measure to end the partial shjutdown, voting 52-44 on the legislation, also short of the 60 votes needed to defeat a filibuster. Six Republicans crossed the aisle to vote for the bill, including Utah Senator Mitt Romney. GOP Sens. Lamar Alexander (Tenn.), Susan Collins (Maine), Cory Gardner(Colo.), Johnny Isakson (Ga.), Lisa Murkowski (Alaska) and Mitt Romney(Nev.) broke rank and voted to advance the stopgap bill, which would have reopened the quarter of the government currently shuttered and funded it through Feb. 8. The two failed votes in the Senate all but guarantees that the partial government shutdown will stretch into next week, while more than 800,000 federal workers will miss their second paycheck on Friday. Last month the Senate passed a continuing resolution (CR) that would have prevented the partial shutdown and funded operations until February 8, however it was ill fated after President Trump said that he would not sign any legislation that did not include $5.7 billion for his border wall. "Leader McConnell says that President Trump’s bill is the only way to open up the government – bull. He claims our bill won’t pass because President Trump won’t sign it. Has he ever heard of a veto override? Has he ever heard of Article I?" asked Senate Minority Leader Chuck Schumer (D-NY) from the floor of the Senate on Thursday. Schumer has called Trump's plan "harshly partisan," adding that the pain caused by the shutdown is "getting deeper and deeper every day." Trump, meanwhile, is not backing down from his demand for wall funding - tweeting Thursday morning ahead of the vote "Without a Wall there cannot be safety and security at the Border or for the U.S.A. BUILD THE WALL AND CRIME WILL FALL!" The debate has largely come down to a fight between Senate Majority Leader Mitch McConnell and prominent Democrats - who have refused to budge on wall funding despite concessions made by President Trump towards DACA recipients. 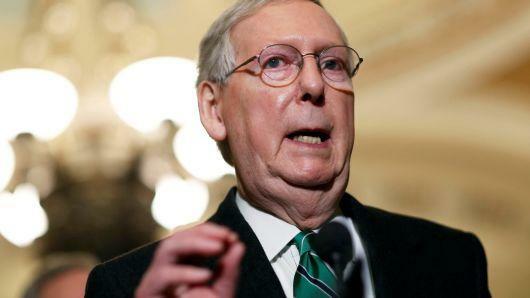 Majority Leader Mitch McConnell (R-Ky.) tried to characterize the decision between the two votes as wanting to make a “law,” by backing the GOP effort, or trying to make “points,” by supporting the short-term continuing resolution. "They know the Speaker of the House is unreasonable on these subjects, with her own members and her own House Majority Leader openly contradicting her on national television, and that Senate Democrats are not obligated to go down with her ship," said McConnell, speaking from the Senate Floor. McConnell called Trump's plan a "pragmatic compromise that could end this impasse right away," while the Democrats' temporary measure would ensure a new crisis in several weeks when the funding expires. Trump's measure would ban people under the age of 18 from El Salvador, Honduras or El Salvador from receiving asylum in the United States unless they apply at a processing centers in Central America - meaning they could not apply in the US. Trump's plan also includes three-ytear work permits for undocumented migrants enrolled in the Obama-era Deferred Action for Childhood Arrivals (DACA) program, with similar protections extended to people from countries such as Haiti and El Salvador who are currently living and working in the United States. Trump has previously tried to end both programs. Earlier Thursday, billionaire Commerce Secretary Wilbur Ross questioned the need for unpaid federal workers to visit food banks, telling CNBC: "The obligations that they would undertake - say borrowing from a bank or credit union - are in effect federally guaranteed. So the 30 days of pay that people will be out - there's no real reason why they shouldn't be able to get a loan against it." In response, Pelosi accused Ross of a "let them eat cake" attitude. Pelosi wasn't the only one to pick up on Ross' apparent lack of empathy. Ross later clarified that he is "painfully aware that there are hardships inflicted on the individual workers," adding "ll I was trying to do is make sure they’re aware there are possible other things that could help somewhat mitigate their problems."